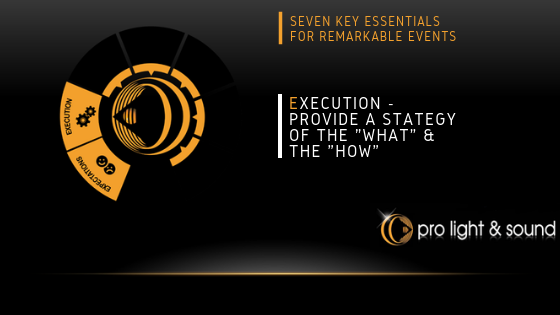 When creating your remarkable event, the concept is similar. Once you are clear on the expected outcomes (click here for information on expected outcomes) and the desired impact of your event. It is time to work on strategic execution. Creating a plan to achieve the desired results starts with developing a strategy of the “What” and the “How”. Available in-house AV – Quality? Suitability? How do we achieve the desired outcomes within these constraints? Liaise with your Event Partners to execute your vision. Meet with experts early in the planning stages so all the stakeholders are on the same page with the roll out. Audio visual, theming, menus, decor, furniture all need to fit together to create the final picture. Integrating all these elements is the key to a successful and memorable event. When planning and executing an event, the guest experience begins from the very moment guests arrive – the venue, the sights, smells, light and sound all play a crucial role. So all the stakeholders, suppliers and event partners need a clear understanding of the desired guest experience. It is imperative to strategically plan and execute the guest journey beginning from the moment they are greeted right through to the time they leave. The clearer the direction on the use of lights, audio, vision, touch and smell the greater the impact. Creating a remarkable event relies on the guest journey. What kind of journey depends solely on the event producer. The events industry is constantly changing and evolving. Whether you’re a seasoned professional or an up and coming novice, getting the right advice and creating a plan of execution is critical for the success of the whole picture. Pro Light & Sound offer insights gained from over 30 years of experience and countless successful events across a number of different Industries. With roots in Lighting and Audio design in the Entertainment Industry, Pro Light & Sound brings a creative flair to the, oft times, dry and desolate world that is Corporate Events.